When we think of great National sides in football, the Netherlands are certainly a side that springs to mind. European Championship winners in 1988, and 3-time World Cup finalists they are certainly a side who have contributed to the global game over the years. The pioneers of 'Total Football', a way of playing which featured heavily in their run to the 1974 World Cup final- a style of fluid, dimensional football that saw players interchange positions and have no fixed role, it would all depend on the situation and shape of the game at the time. For a side so prominent back in the day, it has been rather alarming to see their struggles in recent years. Since losing a foul-tempered 2010 World Cup final to Spain in extra time, the struggles of the Dutch side have been clear for all to see. 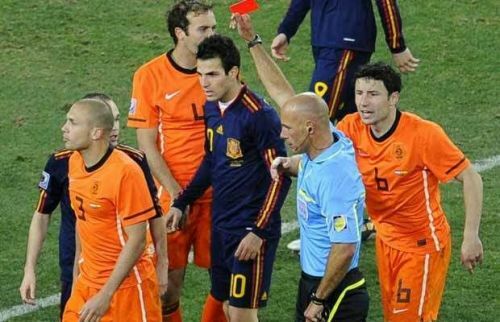 An incredible final which included 13 yellow cards and a red- this was seen by many as the last chance for many of the Dutch old guard to compete in a World Cup for their nation. The likes of Mark Van Bommel, Giovanni Van Bronckhorst and Rafel Van der Vaart were all chasing that illusive title in their glistening careers. However, it wasn't to be and this turned out to be a crushing blow for the national side which was evident in their next major tournament showing. After qualifying for Euro 2012 the Dutch were drawn alongside Germany, Portugal and Denmark in what was dubbed the 'group of death' due to it's extremely strong makeup of sides. Given their performance at the World Cup 2 years previous they were still fancied by many to make an impact and get through what was a very challenging group. The Netherlands got off to a terrible start losing 1-0 to Denmark and followed this up with defeats to both Germany and Portugal. A swift exit from the tournament with 0 points and only 2 goals scored was a bitterly disappointing outcome, with the side aging and in need of an injection of fresh impetus Bert van Maarwijk resigned shortly after the tournaments conclusion. Putting their disappointing Euro 2012 campaign behind them, Louis Van Gaal was able to lead the Netherlands to a 3rd place finish at the World Cup in 2014 with a refreshed squad and some new faces involved. What followed though was a real fall from grace. Van Gaal left to take over the managerial reigns at Manchester United and since then we have seen 4 coaches in charge of the national side. A lack of stability, a crisis in identity and the old guard slowly falling away saw the Dutch struggle massively in a transitional time for the great footballing nation. Failures to qualify for Euro 2016 and the 2018 World Cup were huge disappointments and not something this powerhouse was used to on the national stage. It was clear that the passing of a 'Golden Generation' without any trophies to show for it was disheartening and seen as an opportunity missed. Some optimists however were still managing to stay positive and saw it as an opportunity to welcome in a new generation of talent- and this is exactly what has happened. The current squad looks almost unrecognisable to that of 4 years ago- only four players from their most recent squad were in the 2014 World Cup squad which further illustrates this. The only survivors from that side that managed a 3rd place finish are Daley Blind, Stefan De Vrij, Georginio Wijnaldum and Memphis Depay. Under Ronald Koeman however, the Netherlands have made great strides and appear to be heading very much in the right direction. Determined to return to the greatest stage it would appear that the 'Oranje' have heavily invested in youth, placing trust in the next generation to express themselves and deliver results. In this calendar year, they have only lost twice in 9 games with narrow one goal defeats to England and France certainly no disgrace. There have been some standout displays this year such as a 3-0 dismantling of European Champions Portugal in Switzerland. This has been followed up with a strong showing in the newly formed UEFA Nations League. In a very testing group up against France and Germany they have claimed 6 points from 3 games and have a chance against the Germans tonight to claim promotion from the group and advance to the next stage. The glory days may be returning to the Dutch National Team. So where has this rejuvenation come from? Koeman has been credited with much of this turnaround in fortunes- placing trust in lesser known talents and giving them the responsibility of representing the great Dutch jersey. Prodigious young stars Matthijs de Ligt and Frenkie De Jong have been afforded opportunities under the new regime and have looked right at home. Established stars such as captain Virgil Van Dijk and Georginio Wijnaldum have been in fine form, leading by example to the young stars breaking through. The renaissance of Manchester United outcast Memphis Depay has benefitted the national side greatly too in recent games, he has been able to transfer his blistering club form to the Dutch side and suddenly the Netherlands are a force to be reckoned with once more. More experienced figures in Ryan Babel, Kevin Strootman and Daley Blind have given a sense of balance to what is a youthful squad these days. 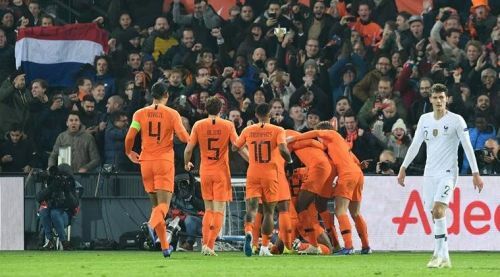 The wonderful football the Dutch were so famous for appears to be resurfacing- a 3-0 drubbing of Germany followed up by a comfortable 2-0 triumph over France at the weekend point to a much improved and confident setup which appears to be growing game by game. With only 1 member of the current squad over the age of 30, there is potential for great longevity in the current group which could deliver success for years to come. Alongside the national team, two of the powerhouses in Dutch football are having very strong seasons. Both Ajax and PSV Eindhoven are steamrollering most teams week in week out in the Eredivisie with a combined goal difference of +70 after only 12 games played underlining their dominance domestically. Success for these two sides on the European stage will surely be the next step, and be very beneficial for the young Dutch players involved in these sides. Ajax have a pool of young talent which is seeing much more game time these days, whilst PSV also hone plenty of young domestic talent. Ajax have impressed in the Champions League so far including a famous point away at Bayern Munich, whilst PSV have turned in some impressive performances notably against Tottenham Hotspur. With a blend of youth, experience and raw talent it appears that the Dutch fans may be getting their beloved national side back to where they belong. If they continue in this manner they will surely be at the next few major tournaments and who knows what their ceiling will be? Koeman appears to be guiding them in the right direction, but time will tell whether the faith placed in this youthful crop of players will bear fruit.